Okay guys and gals, The base for my newest project arrived yesterday So I thought I'd start a thread detailing it's modification. 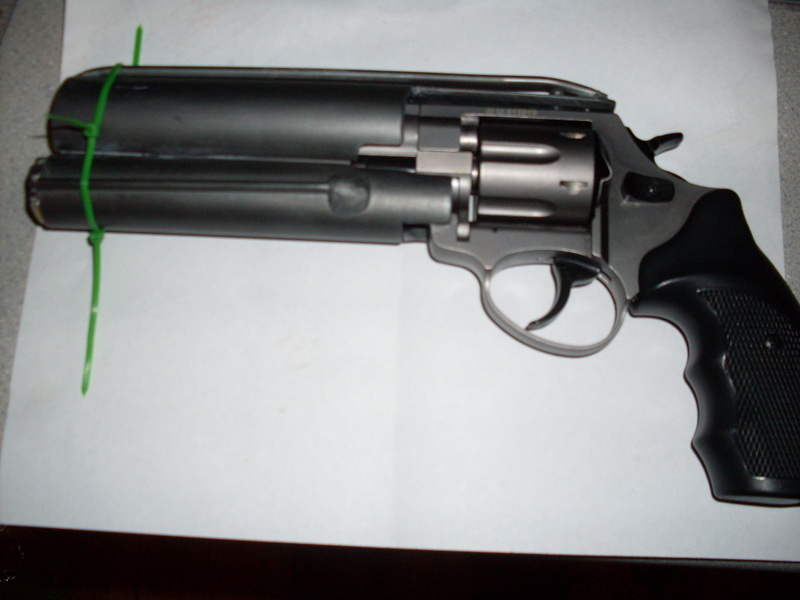 It's a Zoraki R1 9mm or .380 Blank firing revolver. Thoughts comments questions feel free to post them up. I look forward to drawing upon the vast wealth of knowledge the board has to offer. nice piece to start off with! It's a solid gun, very well constructed. Not at all what I expected. 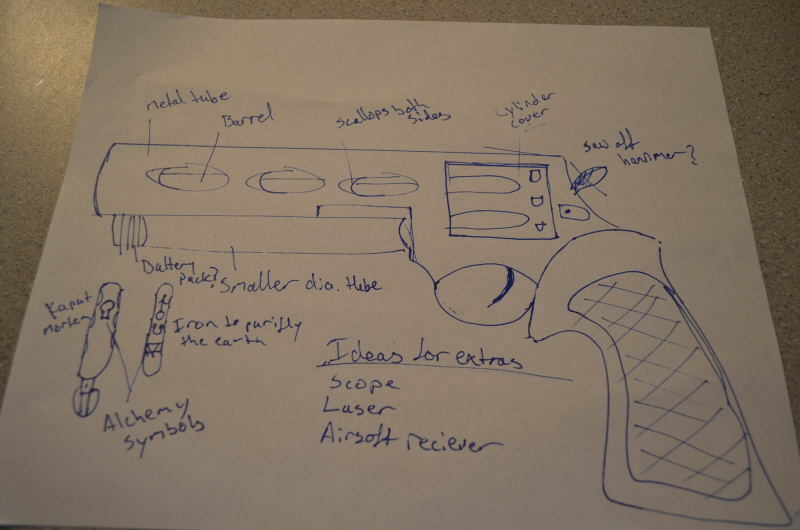 Good base for the project(even if it's only blank firing, you'd expect a solid gun capable of withstanding the power generated by blank rounds). So I'm wondering if I should use PVC tubing for the outer barrel or thin wall metal. I'd go with PVC...but that's because I have no tools to work/machine metal with. 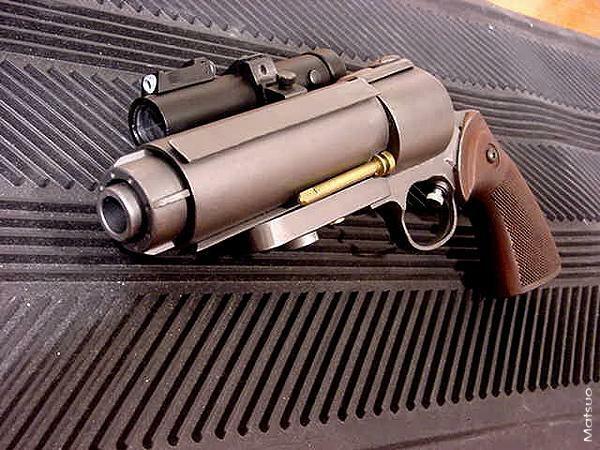 Weight will be a factor on your build since that gun seems heavy. Zoraki makes much better blank firing guns than Ekol or Bruni or Kimar. Umarex and Zoraki are the best around. If you're planning to mount anything in the gun itself, I do advise you pick up an extra set of taps to thread with. Your inspiration is one of my favorite builds by Matt. I love that blaster! 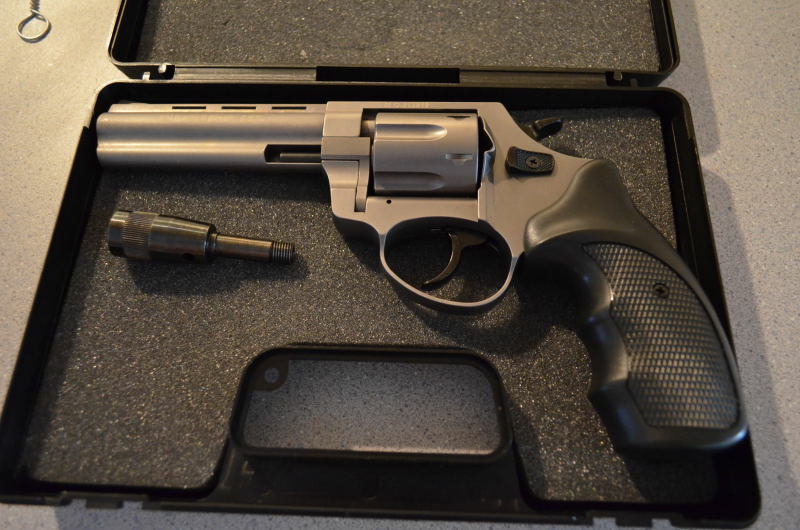 I'm planning to pick up one of these revolver soon to do a Split Second revolver. I would have liked to go with metal but, unfortunately I'm now on a bit of a time crunch to get it finished and shipped out. That, and I don't have all the tools necessary to properly build it using all metal. I'd have to agree about the Zoraki build quality. 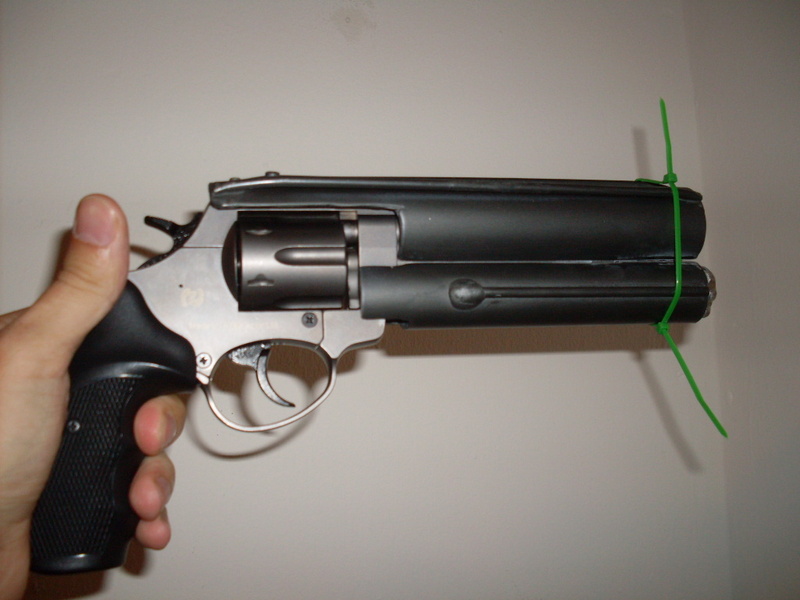 I have a Kimar SAA blank gun, and the quality is more on par with a Denix replica, which is to say the metal is pretty soft and the finish pretty thin. Doable, but the Zoraki is much better. I'm going to try and get this finished by this weekend, so stay tuned folks! made some good progress just in the couple hours I've been at it today. Now I need to think about greeblies.... anyone have some thoughts about what I could put on this thing? Also, anyone know of a good filler that would adhere well to PVC and still take some abuse? Okay so I didn't get as many progress pics as I wanted, but I had to get the thing done which I did. I lieu of pics I'll just say that I found the PVC to be pretty easy to work with, my trusty dremel made pretty short work of it. I bought some Model Master Metalizer in gun metal (of course) and I gotta say, while I was a little leery at first it has a great finish, though a little thin. I still can't decide on whether or not to slap a coat of sealer on it or not. Probably not as it has to get shipped out today. I also added some small diameter tubing along the out side to break up the outlines of the piece. and also added a small skull trinket to the under-barrel area. I would have chosen something different, but as the film it's going to be used in has a alchemy subplot and they wanted the symbol Kaput Mortum on it, so I had to put it on there somewhere. Now for some crappy PICS!!!!!!! Not bad...difficult to see what's going on at the front and on top(some type of grove or raised lines on the barrel). How are you going to secure the whole shebang? I attempted to do them on a scrap piece but I couldn't get them reliably uniform so unfortunately, I decided to abandoned that aspect of the design. What kind of tools do you have? But actually, what I really want to do for the next iteration is buy the HTG sniper rifle that has the almost identical receiver to the Steyr along with a few parts from Rich, and try to make a blank firing version of the blaster we all know and love. Before I can get started on that I'll have to wait until the project it's being used on wraps shooting, I had to ship it out last monday to make sure it gets on set in time for filming. I'd love a drill press but the closest I could do right now is get the one that uses the dremel. Space is at a premium and I don't have anywhere to put it.